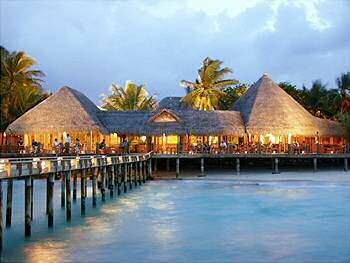 Kuramathi Blue Lagoon Maldives Resort offers 20 stunning water bungalows and 36 beach bungalows. The food is delicious and varied and the service is excellent: you don't need to do anything but relax and enjoy! The water bungalows only offer a shower where the even more luxurious beach bungalows offer you a shower, a bath and an open air shower. Kuramathi Blue Lagoon is situated on Ari Atoll, Maldives, 35 miles from the airport, located on the western tip of Kuramathi Island. It is also spelled ' Kurumathi Blue Lagoon Maldives Resort '. You can reach the resort by seaplane in 15 minutes or by boat in 90 minutes. We used a boat and the water is quite bumpy. You will arrive in Kuramathi Village, get a refreshment before being taken further to the lagoon. Once you reach Kuramathi Blue Lagoon, you are in paradise! The Kuramathi Blue Lagoon Maldives Resort has 1 bar (Laguna Bar) and 3 restaurants: the Blue Lagoon Coffee Shop, La Lagoona Grill and the main Blue Lagoon Restaurant. Make sure you opt for an all inclusive package offering you all drinks and cocktails free from the resort. You can book a sunset cruise, snorkeling, local island trip and an island hopping excursion (all are included in the all inclusive package). Nothing much to do for your children though. Remember you are in the tropics so bring the strongest sunblocker possible when exposing yourself to the sun on the beach or when snorkeling in the water! You can contact the resort as follows: Phone Number: (960) 666 0527 and Fax Number: (960) 666 0556. If you want to wake up and look out at the sea from your bed, then book a bungalow at the Kuramathi Blue Lagoon Maldives Resort!